When the doors of the gargantuan Charles M. Schwab mansion named Riverside House were opened in 1947 for the sale of the interior fittings, among the 100 viewers was S. Archer Gibson. The elderly man was not there to buy bronze hardware or stained glass windows. He was reminiscing. In the soaring two-story chapel area of the French Renaissance chateau Gibson touched the cabinet of the grand pipe organ he once played as Charles Schwab’s private organist. The impressive instrument had been enlarged by the millionaire at Gibson’s request in 1904 at a cost of $21,500 and again in 1911 for $23,457.50 more. The days when the fabulously wealthy installed pipe organs into their homes and hired private organists – Gibson earned $10,000 per year – were over. And the days of Schwab's extraordinary mansion were over as well. 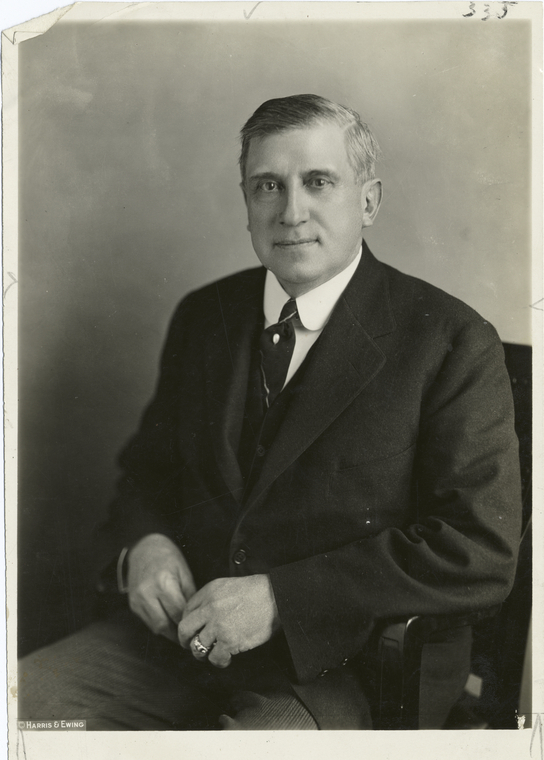 Steel tycoon Charles M. Schwab had no intentions to built just any house in 1901. His would be the largest and most expensive. And he intended that it would vastly outshine the mansions rising on Fifth Avenue along Central Park. Schwab had started out in the steel business as a teenage laborer in a Carnegie steel mill and was by now one of the wealthiest men in the country; the head of United States Steel. 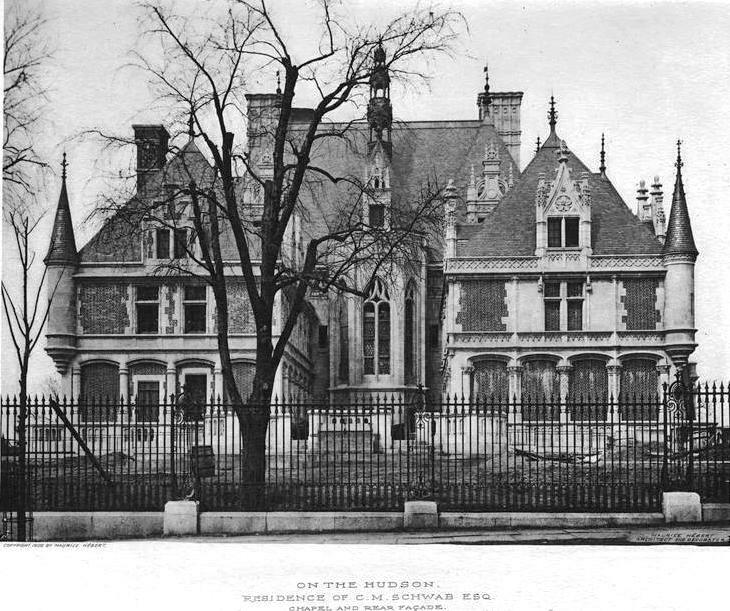 Among the Fifth Avenue houses, only Andrew Carnegie's mansion rising at 91st Street and 5th Avenue had a vast garden and fenced yard. The free-standing home was unique in its luxurious setting. 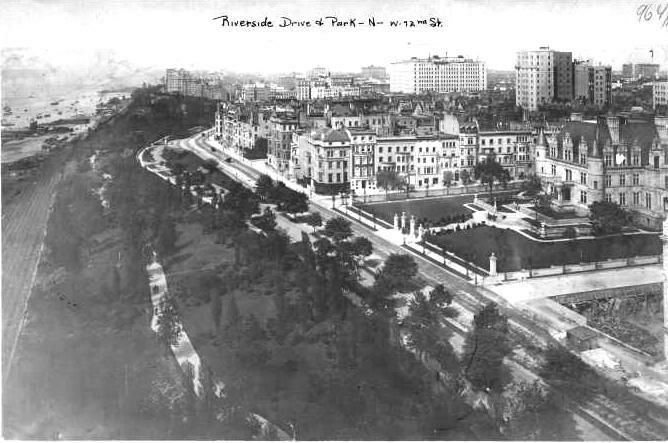 Along Riverside Drive, however, millionaires were opting for free-standing residences surrounded by lawns. 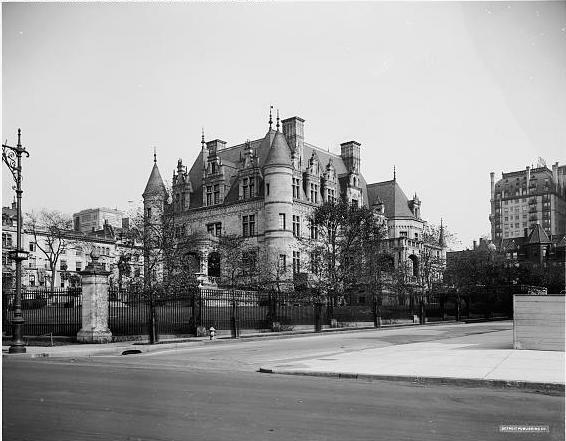 This is what Schwab had in mind when he spent $865,000 for the full block on Riverside Drive in 1901, extending to West End Avenue, between 73rd and 74th Street. It was the most ever spent on a building lot to date. The magnate commissioned architect Maurice Hebert to design a French Renaissance chateau that would impress. Hebert did exactly that. The tycoon spent $3 million on the structure and several million more for the furnishings and antiques. It was a four-story palace with a 166-foot tower that offered panoramic views. To supply the vast amount of stone to build it, a quarry was opened in Peekskill, New York. According to Robert Hessen in his “Steel Titan: The Life of Charles M. Schwab,” “Schwab had a passion for owning the biggest and the best – homes, or automobiles, or private railroad cars.” Riverside House would exemplify that passion. More than 100 artists, designers, modelers, engineers and architects were engaged in the construction. Hebert personally supervised the work of artisans at the William Baumgarten & Co. creating reproduction tapestries for the house – several of which were exhibited at the St. Louis World’s Fair before being installed in the house. Ceilings and walls were decorated by artists like Albert Mantelet, Arthur Thomas and Jose Villegas. Rooms were executed in various periods; the dining room in Louis XIV, the library in Henri II (a copy of the library in Fontainblue), the parlor in Louis XVI (copied from the Petite Trianon), the main hall in Francis I and so on. 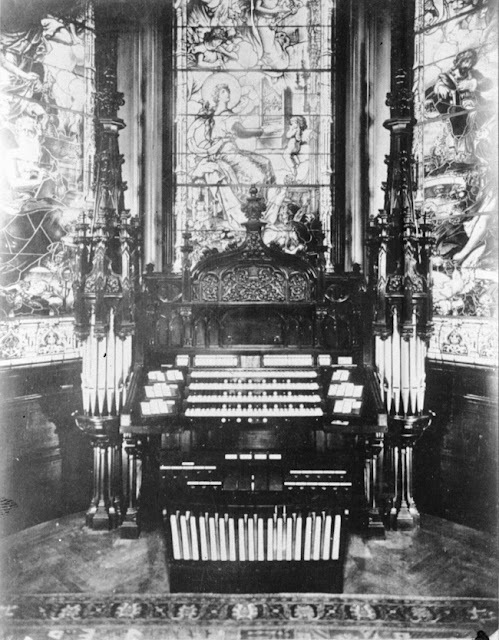 The chapel, where the custom-made organ was installed, doubled as a music room and was large enough to seat a full orchestra. A natatorium in the basement featured a glazed-brick pool 20 by 30 feet under an arched glass roof. There was a bowling alley and 50-foot gymnasium on this level as well. The master bedroom was 20 feet square and the adjoining bath had a five-foot square shower stall. There were a four-car garage, a receiving lodge for incoming goods, and a service tunnel beneath the sculptured gardens. 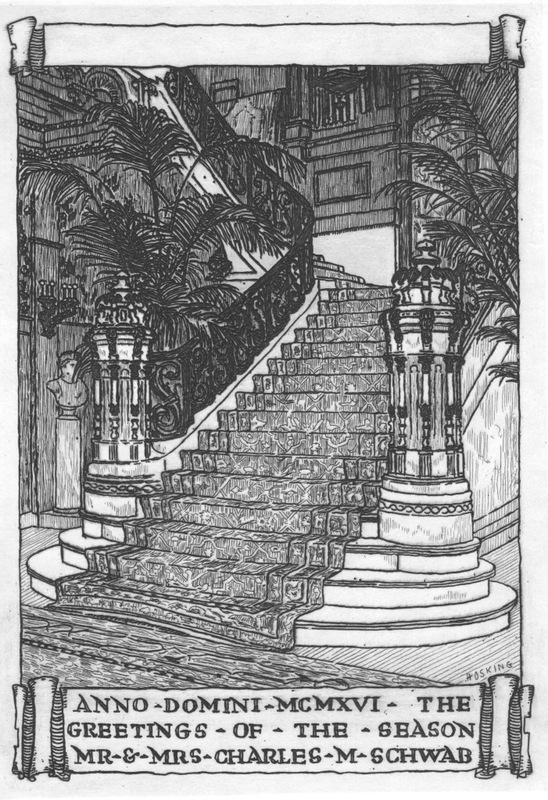 The grand staircase -- many thanks to Jim Lewis for this photo from an Aeolian Organ advertisement. Schwab’s wife, Eurana, had protested against moving so far northward, fearing she would never see her Fifth Avenue friends again. After a period, despite her Fifth Avenue friends visiting regularly, Rana Schwab stopped accepting social invitations – even those to the White House – out of embarrassment of her physical condition. The food-loving Rana became severely overweight. She stayed in Riverside House, catered to by her 20 servants--chief among them George Stone the butler. Nevertheless, in 1917 as World War I raged in Europe, she dedicated two rooms of the first floor for the use of Red Cross volunteers who knitted sweaters, socks and bandages for soldiers in France. The Schwab's 1916 Christmas Card featured the staircase -- many thanks to Jim Lewis for this great image. In 1921 S. Archer Gibson was recorded playing the Schwab organ, creating what would be among the earliest organ recordings. Later, in 1932, Schwab agreed to allow the National Broadcasting Company to broadcast a series of Wednesday night organ concerts played by Gibson. The couple lived in luxurious comfort in Riverside House until Schwab’s fortunes were wiped out by the Great Depression. The massive mansion changed almost overnight from a palace to a hulking white elephant. Unable to pay the taxes Schwab tried futilely to sell the property for $4 million. 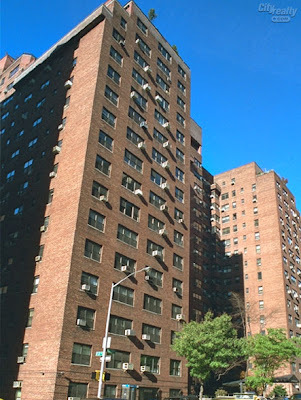 He moved into a small apartment on Park Avenue in 1939 where he died nearly penniless later that year. The mansion sat ghostly and vacant for years. 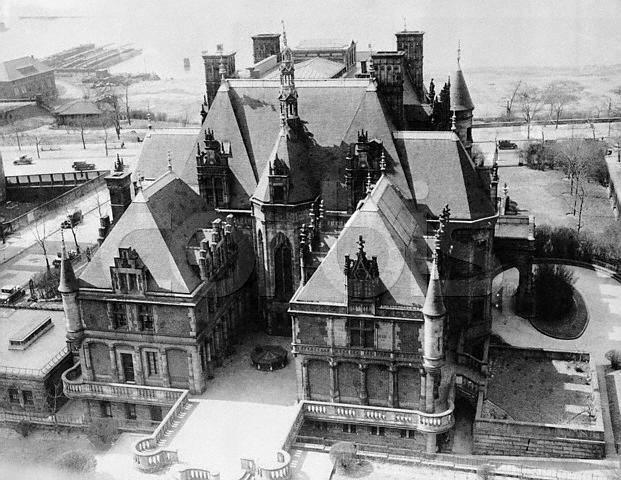 Mayor Fiorello La Guardia rejected the idea of using the house as the mayoral mansion, feeling it was far too grandiose. It was the last hope for the hulking and sumptuous Schwab house. After sitting empty for a decade, the land was purchased as the site of an apartment building. 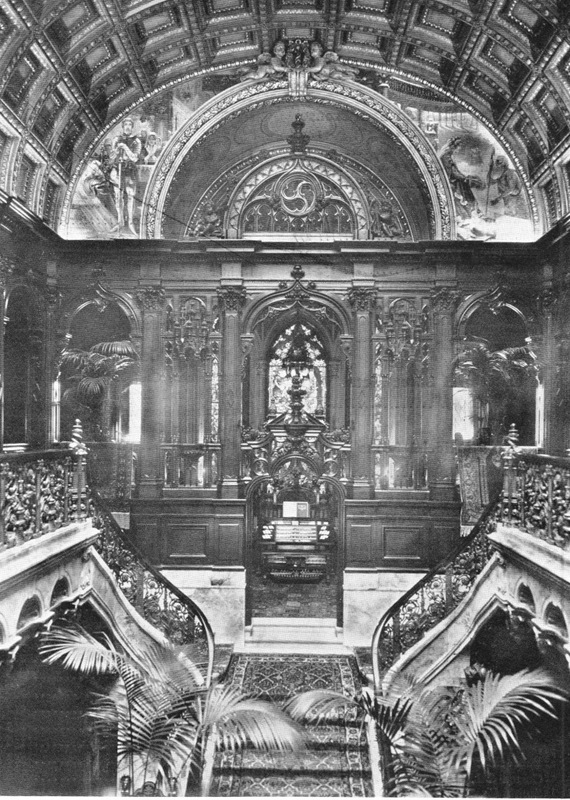 The sale of the interior fittings which organist S. Archer Gibson attended was the last time visitors would stare in awe at the painted ceilings, the carved grand staircase and the marble columns. The wrecking company informed the press a few days later that the great pipe organ in the chapel was too large to remove. It would be smashed with the rest of the house. At the eleventh hour, however, Eric Sexton of New Canaan, Connecticut purchased the instrument, disassembled it and installed part of it in his home in Camden, Maine. Just about every one of your amazing posts contains a book in it. But this one especially deserves a full telling. Thanks for sharing this emblematic New York story. Thanks for the compliment. Can you imagine what would have become of this house had the Depression not hit and it had survived? Boggling to think about. It would have made a nice campus for one of the private schools. But I suppose none were rich enough at that time to save it from the wreckers. Alas. How lucky you were to have seen it before it was demolished. Charles Schawab is my wife's great great uncle we like to research family history. You certainly have a wealth of history to research! Hope I helped. Thanks for writing. Awesome, fascinating story. How I wish I could have seen it in real life. But thanks to you, I've seen it in my mind's eye, through your wonderful account! Like many of the beautiful homes and buildings in Manhattan, this one will forever be one of the grandest. What a sad shame that such a magnificent structure lives on only in photographs. Thank you for giving us a glimpse of a by gone era and the homes of the people who lived in it. I always wondered what the UWS looked like so many years ago, now with these wonderful old pictures we all can see into the past and marble at it's former glory. My great-grandfather built the biggest house in Crown Heights c. 1920 for his 9 kids and assorted servants. Each daughter got a set of the Jewish Encyclopedia and a set of Community Plate silver for her wedding. He founded two synagogues, both of which are still Jewish institutions today (as opposed to churches or demolished). He had made his fortune in coats. By 1938 the company was broke, he was almost penniless, he died of depression, my great-grandmother survived on the payout from his life insurance. Today the house is an empty shell. I saw it once, 25 years ago, when a family was still living there. 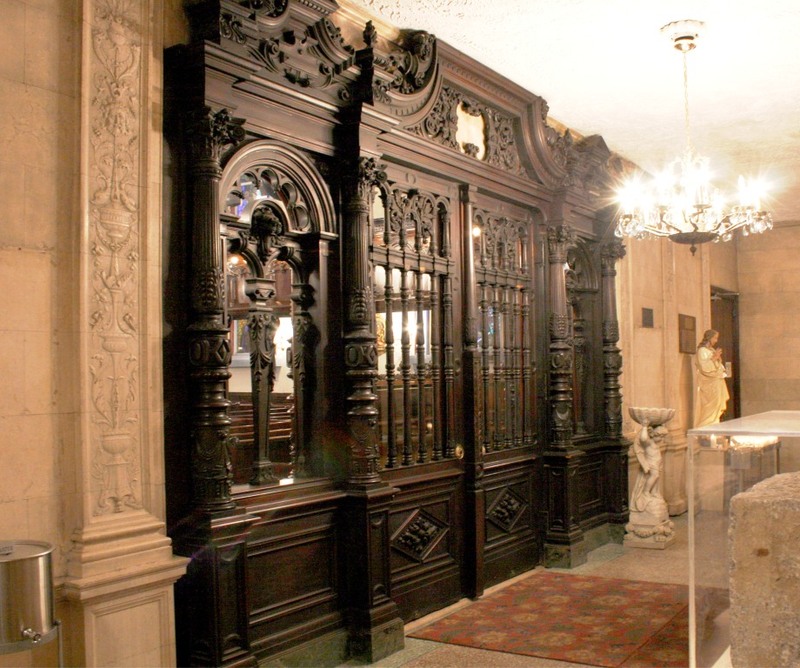 Dining room was Tudor, living room was Gothic, stained glass in the stairwells and bathrooms, dark wood paneling in my great-grandfather's former office, basement kitchen tiled all the way to the tops of the windows (I had seen that in pictures). Now, after that family sold it, and there was an inheritance fight among the children of the guy they sold it to, it's an empty hulk - look in the windows, see empty air all the way to the roof joists. Last time I looked, it hadn't fallen in yet. Such character the Schwaab mansion had, to be demolished for high rise apartments that have no character whatsoever. Heartbreaking! Why are there not laws to protect pipe organs? So many grand pipe organs have suffered immeasurably by ignorant, uncaring, selfish, ruthless individuals who think nothing of ripping out, smashing up, and disposing these instruments. In my view to destroy a pipe organ is one of the worst crimes committed by humankind. Why aren't there lobbiests to step in and get congress to pass laws to stop the destruction of pipe organs! Something needs to be done! What are we going to do? !